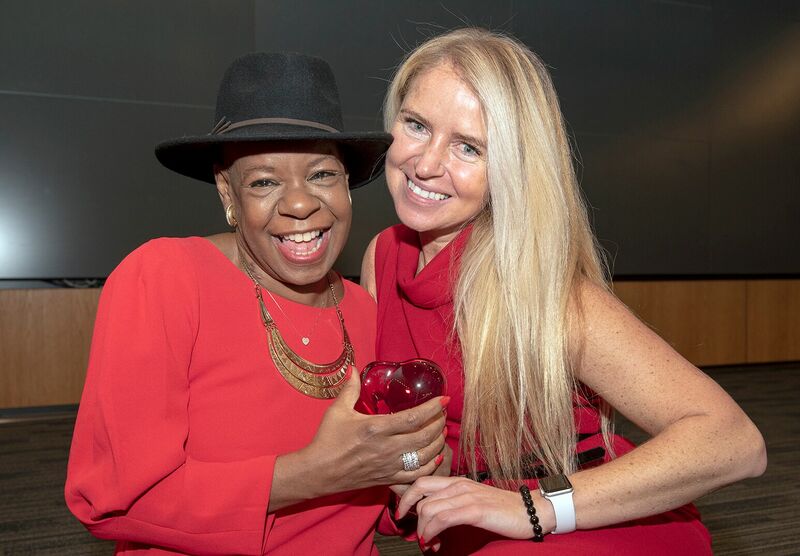 It was a sea of red as hundreds of Northwell Health staff members gathered together for the annual “Go Red for Women” celebration. "Symptoms of heart attack are different in women"
Stacey Rosen, MD, who serves as vice president of Women’s Health, also expressed her gratitude to Ms. Bass, and then urged women to heed the warning signs of illness before it’s too late. Dr. Rosen has been on the forefront of urging women to take care for their own health, along with the needs of their families. Echoing that sentiment was Evelina Grayver, director of the Coronary Care Unit (CCU) at North Shore University Hospital. For her, the key to good health comes from knowing the signs of illness and working hard to prevent future medical problems. This realization brought her to Dr. Grayver; follow-up tests revealed the presence of blockages. Luckily, no stents or surgery were required, but the news served as a wake-up call to action. Finally, the audience heard from Yvonne Fleming, the first patient to undergo heart transplantation surgery at NSUH. The day was especially meaningful for Ms. Fleming, who is looking forward to celebrating her first anniversary with her new heart on February 19th. It should be remembered that heart disease is the No. 1 killer of women in the United States. But, as all three doctors pointed out during the event, fully eighty percent of heart disease risk is preventable.